Try our new and improved Banana Walnut Coffee Cake, with more bananas and more fruit flavor! Make your inner monkey happy! CoffeeCakes.com Banana Walnut Coffee Cake has a rich cinnamon walnut sour cream coffeecake batter flavored with slices of fresh ripe bananas. 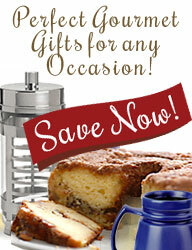 This coffee cake makes a great gift for giving and entertaining. The CoffeeCakes.com Banana Walnut Coffee Cake is trans fat free and does not contain any artificial coloring, artificial flavoring or preservatives! This one-pound twelve-ounce coffee cake serves approximately 10 - 12 and can be frozen up to four months. New! A CoffeeCakes.com Exclusive! Send a gift...or enjoy tea and cookies with a close friend. These exotic flowering teas and the gooey goodness of Dutch caramel cookie wafers are best shared! Watch beautiful flowering teas unfold and bloom in hot water and enjoy a pot of delightful Jasmine scented green tea.